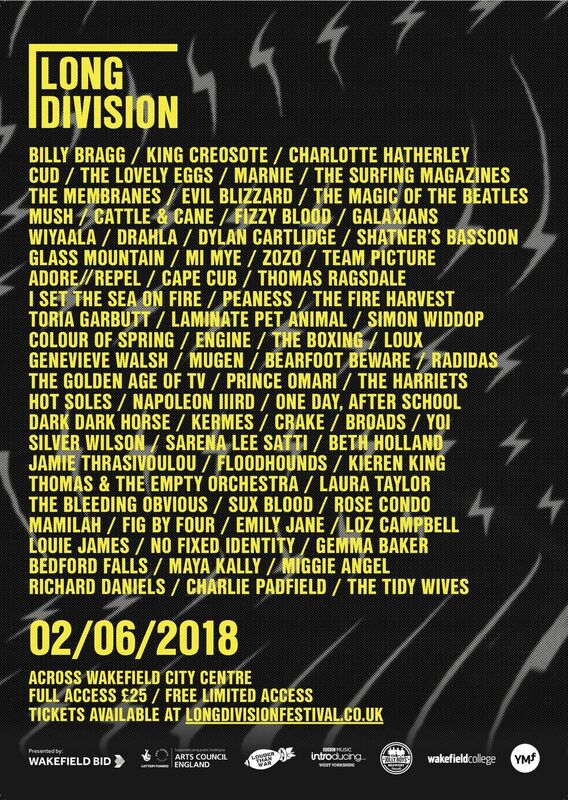 Wakefield’s Long Division festival has announced a brace of new artists for its 2018 event alongside the first taste of it’s arts and culture programme. Leading this announcement are post-punk legends The Membranes who will be bringing their immense live show and a full choir to Wakefield Cathedral as part of the festival. Speaking about performing at Long Division The Membranes’ John Robb said: “Membranes are looking forward to returning to Long Division this time with their choir to play songs from their upcoming autumn released album that turns its attention to the beauty and violence and voluptuous essence of nature. Joining them at the recently-revived West Yorkshire festival will be garage rock super-group The Surfing Magazines, featuring members of Slow Club and The Wave Pictures and the rubber masked, quad-bass player toting noise rock enigma of Evil Blizzard. Also announced today is Ghanaian pop singer Wiyaala, Leeds up and comers Fizzy Blood, the politically charged and critically acclaimed Life from Hull and rising post-punkers ZoZo among many others. Having recently announced its return after a fallow year and some soul searching, Long Division has made a pledge that 90% of its programming will be free as part of a commitment to making the arts accessible to all in West Yorkshire. Today they’ve shared the first of a number of commissions, projects and shows that will take place in Wakefield during the course of the festival including Write Place Write Time, a panel on the creative and writing process featuring special guests Billy Bragg and acclaimed journalist and deputy music editor at The Guardian Laura Snapes taking place at Wakefield Town Hall on Friday 2nd of June. Also announced is Visible Words From Invisible People, where people from Wakefield’s homeless community worked with artist Richard Wheater on a project that aimed to develop their visual language through light, to communicate their stories to the wider public which resulted in a series of extraordinary neon signs which will be displayed at the festival as part of ‘A Manifesto For A New Wakefield’ supported by Arts Council England and The Magic Of The Beatles, who will be performing a free show on Wakefield Precinct on Sunday 3rd of June. Long Division was founded in 2011 and is dedicated to promoting independent, creative and forward-thinking artists and creating engaging and unique new work. It is Wakefield’s largest festival of Music & Culture and has hosted artists including British Sea Power, The Cribs, The Fall, Ghostpoet, Ash, Pulled Apart By Horses, The Wedding Present, Robin Ince, Josie Long and Simon Armitage. This year Long Division is presented and supported by Wakefield Business Improvement District and Arts Council England. ROAD TO ULTRA AUSTRALIA – IT’S A WRAP! !